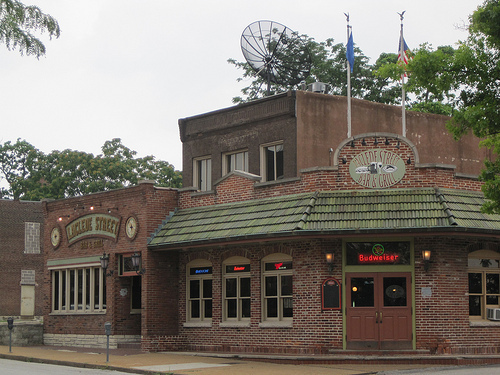 Now The Laclede Street Bar and Grill, the old Caleco's Building will soon give way to student housing! There is actually a Facebook page, Caleco’s Reunion, that was created a few years ago when a group of former employees decided to get together and share some memories. When Tony Bono and Frank Soltysiak Sr. owned the restaurant it was one of the best places to work in the 70’s and 80’s. I “grew up” in the Caleco’s restaurant world. I started in the kitchen at the Chesterfield location in 1977, the first woman in the kitchen, as the salad person of course the guys all gave me a load of crap and even the kitchen manager told me I wouldn’t last one year later I was a kitchen manager and could cook on any of the lines as good as anyone. The goal for anyone who worked in any of the other locations besides Laclede was to go to there and prove yourself as a worthy cook, server, bartender or manager I did all of them. The back bar on a Saturday night when Jakes Leg was playing was the place everyone wanted to be, the money was great the night went fast and you got to listen to one of the hottest bands going at the time. The bands we would have play there, Jakes leg every Saturday night almost, Serapis although they have downsized are still playing in St Charles, Charles Glenn was not only a server he played in the band Fantasy, Walnut Park A.C.’s, Fanfare, Fairchild and many more. The rugby clubs that would come in on Sundays after games in Forest Park. Our friend Frank Spain who was always the man at the door asking for ID’s and breaking up the occasional brawl. You never wanted to be the last and only one upstairs in the place because Douglas the ghost would like to prank with you, oh yes it is haunted and too many of us have experienced him to say otherwise. But he never hurt anyone just would pleasantly screw with us. The nights on the parking lot when after a Saturday night that had a waiting list most of the night when the kitchen staff and the servers would hang out and laugh and joke about how brutal the night was no animosity just a group of hard working students, older adults, black, white, Mexican, some from Africa, long hair, short hair, no hair all just having a good time.